The chink and daub work to seal the log walls of the Snickersville Academy--heading for completion this summer--gives, as Justin LaMountain remarks--"a new meaning to the words, 'restoration using local materials.'" Not only are the daub and chinking stones and logs of local origin, the very water he is using to prevent and seal up cracks comes right from the creek that runs by the Academy, explains Justin. Justin is assisting master log-work craftsman Eric Westergard with the chink and daub work this summer. Justin is also a professional forester who helped trim out non-native brush from the site earlier in the year. We were a bit worried in late June, when we ran low on the historically authentic daub compound—a period mix of lime, clay, and sand―prepared by Allen Corcoran of Cochran’s Stone Masonry & Timberframing in nearby Lincoln, Virginia. But just-in-time-delivery of several new barrels of daub saved the day. Authentic daub is actually better suited to log structures than the modern Portland masonry cement, according to Friends of Bluemont vice president Mark Zalewski, who is in charge of the physical restoration work. The daub makes a tighter seal and expands and contracts with the logs and with the seasonal changes in outdoor temperatures. How Daubing is Done. "This is exactly the way the Snickersville Academy was originally built," explained Mark. "There were specialists in chinking and daubing in those days, just as for any other early American craft." Using a slant patterns means that the stones may vary somewhat in size and shape (obviously, they are not all exactly the same size like, for example, bricks) in order to fit the irregular space between the logs and to make contact with the log above and below them. The slant also distributes the weight on the flat side of the stones, rather than concentrating it on the more fragile thin edges. The stones are then pounded with a mallet to wedge them tight between the log above and below them. Then comes the process called "hurling." The dauber throws handfuls of compound at the chinked space to get it filled deep in between the chinking stones. He pushes the daub in and then spreads on a rough outer coat. This traditional craftsmanship assures that the stones and daub, as well as the logs, are load-bearing. The cabin is not supported merelywhere the logs meet at the corners. The finished wall is an integrated, load-bearing structure of logs, stone, and daub. The dauber is not finished yet, however, because the daub dries more quickly on the outside than the inside, creating cracks. He then sprays the cracks with water. 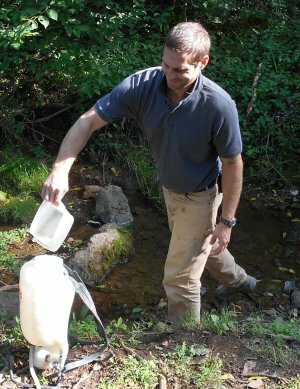 (See Justin with his water-filled backpack in the picture above; and filling up at the creek in the picture to the right.) 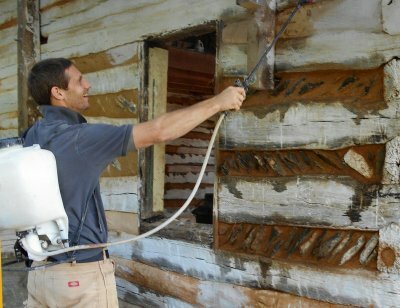 Spraying with water slows and conditions the drying process. Concluding the Log Work. Master craftsman Eric Westergard continues his expert log work with Bluemont's "Old Schoolhouse." He recently replaced two deteriorated short logs at the back wall. Only one sill log (bottom log) remains to be placed. Using hand-operated wedges, braces, and lifts, Eric will soon insert the massive sill log at the bottom of the front wall of the Academy. 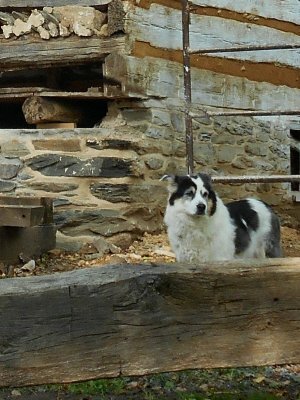 Pictured here is Justin's dog Madison, guarding the sill log and the work site. By the time of the Bluemont Fair (September 20-21 this year) all the log and stonework should be complete. Come to the Bluemont Fair, September 20-21, and see the progress on the Snickersville Academy. On Sunday afternoon, join in with thegrandchildren of Susie Neal as they share memories of living in the "Old Schoolhouse"as children during the 1960s. For more about the Snickersville Academy go to Facebook and LIKE Friends of Bluemont.